1. My diagnosis is: Chronic Complex Migraine. 2. My migraine attack frequency is: daily headache, migraine 3-6 days weekly with current treatment. 3. 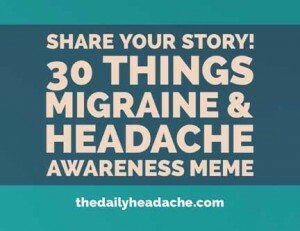 I was diagnosed in: Initial migraine dx in 1997, Chronic Complex dx in 2014. 5. I take 12 medications/supplements each day for prevention and 3+ medications/supplements to treat an acute attack in addition to self-administered IM shots. Also, I receive 30+ injections in my face, head, neck and shoulders every three months. 6. My first migraine attack was: when I was ten years old. 7. My most disabling migraine symptoms are: Intense pain, unrelenting nausea. 8. My strangest migraine symptoms are: Inability to find words or speak clearly, numb lips. 10. I know a migraine attack is coming on when: I begin stuttering and using incorrect wording, I begin seeing sparkles and rainbows, and my ears feel full. 11. The most frustrating part about having a migraine attack is: Missing out on so much life and letting loved ones down repeatedly. 12. During a migraine attack, I worry most about: Making sure my children are cared for. 13. When I think about migraine between attacks, I think: Better not travel too far from home, bring medications just in case, WHEN will the next one hit, please, God, let it be a good day. 17. My best coping tools are: the support of my family and friends and prayer. 18. I find comfort in: Cool, dark, quiet rooms and praying. 21. Something kind someone can do for me during a migraine attack is: Pray for relief and Keep my area quiet and undisturbed. 23. The hardest thing to accept about having migraine is: Continuously letting people down and knowing it’s not going to cease. 24. Migraine has taught me: Live in the moment and Slow down. Also, I’ve met many others with varying illnesses and I feel like I have a more compassionate spirit with them due to living with migraine. 26. If I could go back to the early days of my diagnosis, I would tell myself: Make memories now. 27. The people who support me most are: my husband, children, parents, in-laws, friends. I’m very blessed with a large, understanding group of loved ones. 29. Migraine and Headache Awareness Month is important to me because: I can outwardly share my experiences in hopes of helping another. 30. One more thing I’d like to say about life with migraine is: It’s challenging in ways you’d never think. The giggles of my children are my favorite sounds, except during an attack. You hold back tears no matter how bad it hurts because you know that it will only increase the pain. Cancelling my daughter’s fifth birthday party, missing our anniversary trip, not being able to attend family holidays and functions weigh heavily on my heart. The guilt stabs at inopportune times. I’m trying very hard to not let migraine own me, but it is exhausting to keep fighting every.single.day. So much of what’s being said is like what I’ve lived thru.Hopefully there is something out there to help. Your story sounds exactly like my daughter’s. It is so hard for meto know that no matter what I suggest or say it absolutely never helps. I cannot believe in this day and age that no one seems to be able to cure chronic migraines. She has been to the “great” Mayo Clinic and during her half hour appointment they basically said we cannot offer anything that you have not already tried. “learn to live with it” was their advice. They have a place in Phoenix Arizona that supposedly treats migraines but did mention it. I understand that some plastic surgeons can perform surgery on the sides of the face but it costs about ten thousand dollars that insurance will not cover because some doctors claimed migraines to perform facelifts. These migraines are ruing my daughters life and I would like to know if anyone has found any real help out there.